Hallett Cove is a coastal suburb of Adelaide, South Australia located in the City of Marion 21 kilometres (13 miles) south of the Adelaide city centre. It has a population of more than 12,000 people. Adjoining suburbs are Marino to the north, Trott Park and Sheidow Park to the east and Lonsdale to the south. The Hallett Cove Shopping Centre is the suburb's largest shopping centre, and has recently[when?] undergone a major redevelopment. New features include underground parking, a food court, a Big W department store and a Woolworths supermarket in addition to the Drake Foodmarkets owned Foodland already in place. The suburb has three schools. Hallett Cove School (Reception to Year 12) which was established in 1987 and is situated in the middle of the suburb. Hallett Cove East Primary School (Reception to Year 7) exists in the Karrara estate on the northern side of the suburb. The Hallett Cove South School (Reception to Year 7) is the oldest school in the suburb and is situated near the Hallett Cove School. Hallett Cove railway station is on top of the cliffs to the north of the beach, and services the greater Hallett Cove area. Originally the line ran inland from there to Reynella and ultimately to Willunga but the section from Hallett Cove onwards was closed in the 1960s. The Coast to Vines rail trail is a cycle and pedestrian path that now follows the old line. A new railway extension was built south along the coast to Noarlunga; Hallett Cove Beach is the first station on this line. Both stations underwent a refurbishment in 2011, giving them a more modern look. Bus routes serviced by the Adelaide Metro run through Hallett Cove, terminating at the Hallett Cove Shopping Centre and Hallett Cove Beach Station. 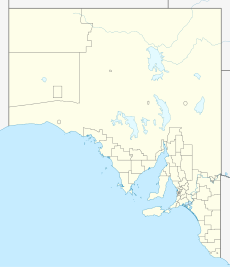 Wikimedia Commons has media related to Hallett Cove, South Australia. ^ Australian Bureau of Statistics (27 June 2017). "Hallett Cove (State Suburb)". 2016 Census QuickStats. Retrieved 5 February 2018. ^ "The History of the Hallett Cove Conservation Park". Friends of Hallett Cove. 12 September 2007. Retrieved 27 July 2009. ^ McBriar, E.M. & Mooney, P.A. (Eds. 1977): Geological Monuments in South Australia, Part 1. Geological Monuments Subcommittee of the S.A Division of the Geological Society of Australia Inc. pp32-39. This page was last edited on 16 August 2018, at 00:59 (UTC).